If you’re looking for an unforgettable family vacation experience, nothing compares to a visit to Disneyland® Park. Let aRes Travel provide you with the best Disneyland® Park ticket hotel package available. 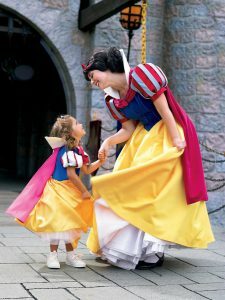 Disneyland® Park has been capturing the imagination of both children and adults since 1955. From Fantasyland, Tomorrowland, Frontierland, and Critter Country, to the elegant New Orleans Square and kid-centric Mickey’s Toontown, visitors will be enchanted by everything the Magic Kingdom has to offer. The Dumbo the Flying Elephant ride, Disneyland Railroad, and Autopia are established and much-loved attractions that have been in the park since it opened. There are also favorites like Mr. Toad’s Wild Ride, Peter Pan’s Flight, and the spinning teacups of Mad Tea Party. Don’t forget the incredible steam-powered paddler, the Mark Twain Riverboat. Once you’ve gotten your fill of the originals, check out Disneyland® Park’s newest additions like Star Tours – The Adventures Continue, where you’ll feel like you’re aboard a Starspeeder 1000. 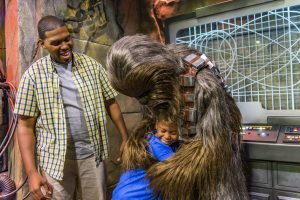 There’s also Star Wars Launch Bay, where you can get an eyeful of behind-the-scenes displays and even meet popular characters from the Star Wars universe. We offer many great deals on hotels, all situated within minutes of the main gate at Disneyland® Park. We can offer you some of the lowest rates in the industry when you bundle your hotel and tickets into one fabulous package. Our partner hotels include all the major chains and boutique properties, some with on-site water parks, themed rooms, and much more. Complimentary breakfasts, free parking, nearby shopping, and park transportation are all available. Let us help you build your dream vacation for a lot less than you might have thought by bundling your park tickets and hotel accommodation together. For amazing savings on a Disneyland® Park ticket hotel package and exclusive deals on travel, call 1 (800) 434-7894 (international callers use +1 (619) 546-5622) to speak with an aRes Travel planning expert seven days a week, or book online now.